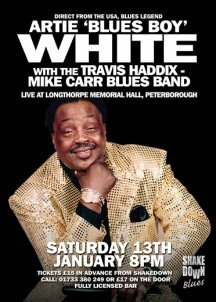 Artie 'Blues Boy' White with Travis HaddixArtie 'Blues Boy' White was born in Vicksburg, Mississippi on the 16th April 1937. His father, a preacher, died when he was three months old and his mother passed away when he was only three. He was raised by his grandmother to sing in church and at the age of eleven joined the gospel group �Harps of David�. When he was 13 he left school to drive lumber trucks in order to supplement the family income and to take care of his ageing grandmother. In the early 50�s he moved to Chicago and joined the �Full Gospel Wonders� and ten years later moved over to the �Sensational True Lights� which is where he met his life long friend Johnnie Taylor. Around this time he became interested in the sounds of B.B King, Bobby Bland and Barrett Strong and he actively began associating with the Chicago blues scene. Albert Collins, Little Milton and Junior Parker became personal friends and it was only a question of time before he himself would cross over. In 1968 Artie recorded blues for the first time and an obscure single appeared but was not promoted and no copies have been found. Then in the early 70�s he recorded singles for Gamma and PM which led to a local hit recording �Leaning Tree� on Altree Records. On the back of this hit Artie decided to run �Bootsy�s Lounge� and this lasted until he recorded a cracking album for Ronn Records in 1985 called �Blues Boy� after which he resumed performing fulltime. He then moved to Ichiban where he often recorded material from his fellow label artist Travis Haddix�s songbook. Ichiban issued six albums by him including two which reached the R&B charts �Tired of Sneakin� Around� and �Dark End Of The Street� before they went belly-up. In 1993 he moved to the Malaco/Waldoxy empire and recorded three wonderful albums of Southern soul blues which included his big hit �Your Man Is Home Tonight�. Then in 2001 Artie decided to start his own record label Achilltown and has issued three lovely albums including the wonderful �First Thing Tuesday Morning�. When he was approaching 70 Artie gave up smoking, kicked the alcohol habit and is still a star name on the Chicago scene and a regular feature at the prestigious Chicago Blues Festival.